Malappuram Superintendent of Police Debesh Kumar Behara said the case will be handed over to crime branch on Sunday. According to police, the Maoists had opened fire at a patrolling party following which police retaliated, killing the two Maoists. A Crime Branch probe was ordered into the encounter killing of two Maoists at Nilambur forests in Malappuram district in Kerala. The crime branch probe was ordered on Saturday night by DGP Loknath Behara as Supreme Court had in September, 2014, laid down guidelines as per which in all cases of encounter deaths a mandatory registration of FIR and investigation by CID or any other independent agency was necessary. A bench headed by then Chief Justice R M Lodha had issued the guidelines in this regard. Two Maoists Kuppuswamy Devaraj (65), a central committee member of the outlawed outfit, and Ajitha (45), had been killed in an encounter with police in Nilambur forests on November 24. Maoist leader Vikram Gowda, wanted in various cases since the past 20 years, was among those who had escaped, police said. The attack had taken place in a 500-acre forest area in the Western Ghats. Improvised explosive devices, materials used in making explosives and explosive materials, solar panels, some battery chargers, a set of pen drives, a modem, an electronic tab, a pistol and 40 sacks of rice were also recovered from the hideout of the Maoists. 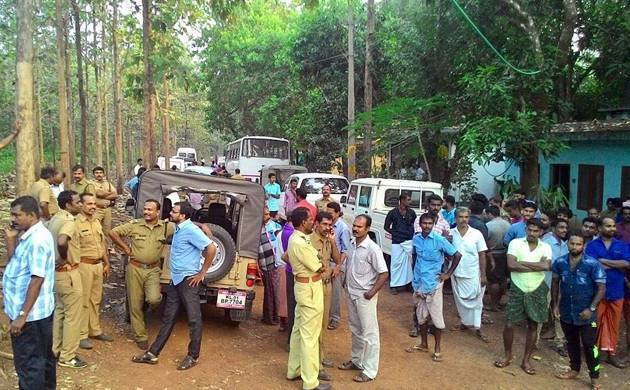 According to police, Maoists fired at a police party on a combing operation in Nilambur area and two of the ultras were killed in retaliatory firing. The search operations were undertaken by a 60-member elite team of the Thunderbolt Force, based on a tip-off that Maoists were camping in the area.